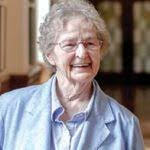 Sister Mary Finn is now 84 years old. Theresa Camden remembers lying on the floor next to the nun supervising her training and feeling something was wrong. Another first-year novice in the small religious order of the Home Visitors of Mary was on the other side of the nun. They were alone in a house in a vacation area outside Detroit; the nun had brought them there on the first of many weekend retreats the three took together. These sorts of experiences with the nun confused Camden, who says she was very naive. After three years of training, in 1972 both novices were suddenly kicked out of the order with no explanation. Five years after that, Camden says the other novice confirmed that she had been having a sexual relationship with Sister Mary Finn during their training. Both women sought therapy and spent years seeking to understand what happened to them. Finally, in the 1990s, the head of the Home Visitors of Mary paid the other former novice $20,000 in an apparent effort to buy her silence regarding Finn. Since the widespread revelation of sexual abuse by Catholic priests in the early 2000s, the public has grown accustomed to stories of boys and young men molested by these once-trusted figures. Far less common are stories like Camden’s – allegations of inappropriate relationships between nuns and the young women they are training. Sister Mary Finn has been a prominent teacher, lecturer, religious leader, and community activist for more than half a century in Detroit. Since 1969, Finn also has been a faculty member at Sacred Heart Seminary, playing a key role in training future priests. Camden says that the order’s focus on such work in the city was a major reason she entered the novitiate after finishing high school. The Home Visitors of Mary is a small local order, started in Detroit in 1949 as an urban mission. Since 2001, it has been operating primarily in Nigeria. The woman in the alleged relationship with Finn doesn’t want to be part of this story. Camden and Susan Shreve, who wasn’t in the novitiate but became a friend of the other woman, both agreed to speak about their knowledge of the relationship and how the local church concealed it. Years later, Shreve says she went with the other woman twice to the chancery to complain about Finn, but the archdiocese was unresponsive. Finally, she and Camden accompanied her on a visit to the HVM convent – and soon after that, Sister Barbara told the woman she had $20,000 for her. “But we had never asked for any money,” Camden explains. “We just wanted Finn to be held accountable. We were concerned about her exposure to other young people” in the community and at the seminary. When asked this month about the $20,000 payment, which Camden says took place in the mid-1990s, Sister Barbara Dakoske, the head of the HVM order, told me it was “the least we could do” to compensate the woman for her therapy. Dakoske refused to answer any more questions because, she said, “I’ve probably already said more than I should have.” She spoke by phone during a visit to the remaining HVM house on Boston Boulevard in Detroit. Both Shreve and Camden dispute her account of the meeting. They both say they were present when Dakoske presented a document for the other woman to sign, then gave her a money order for $20,000. The document, which Shreve and Camden believe to be a non-disclosure agreement, “was part of the deal,” Shreve says. Camden says she didn’t have a sexual relationship with Finn, but charges that she was manipulative and intimidating. After her expulsion, Camden says she asked to be readmitted to the novitiate, and in response, the order sent her to a priest for “spiritual direction.” Before each visit to the priest, she says, Finn would show up at her home and try to influence what Camden would say. The leaders of the order again refused to let her return. Camden says Finn “did whatever she wanted” and “was accountable to no one.” She believes she was “part of the good old boys club” and “the bishops knew about her.” She complains that “none of this was ever addressed by the community” of HVM nuns. Finn, now 84, was still the seminary’s “director of supervised ministry/integrating studies” and an assistant professor of theology when Deadline Detroit called, seeking her response to these allegations. She did not return the phone calls but on Wednesday announced she was resigning from the faculty immediately.